Source: Thomas Nast, "Peace with a War Measure". Originally appeared in February 9, 1878, Harper's Weekly. All Business at a stand still. Except law-making, money making, and irritating strife between capital and labor by Congress. Tweed-ization. By making money of less value we make the poor man richer (and?) law makers that love the people. By not paying our debts. Our credit will be better tha(n?) statesmanship. Down with Capital. Up with Taxes. Modern statemen (?). Soft (?) money. Historical Context: Abraham Lincoln got Congress to pass the first federal income tax in August 1861 in ordert o fund the expected massive cost of the War against the Southern States. It was correctly assumed that the revenues from traditional taxes such as tariffs and excise would not be sufficient to pay for the war. Congress imposed a 3% tax on incomes above $800 which affected the majority of wage earners. The income tax remained on the books after the war had ended although it was reduced in 1867 and 1870 before being abolished in 1872. Economic groups outside of the manufacturing north east felt the burden of tariffs on imported goods more heavily than the protected industrial interests and thus sought to broaden the tax burden by reintrorucing the income tax in the late 1870s. 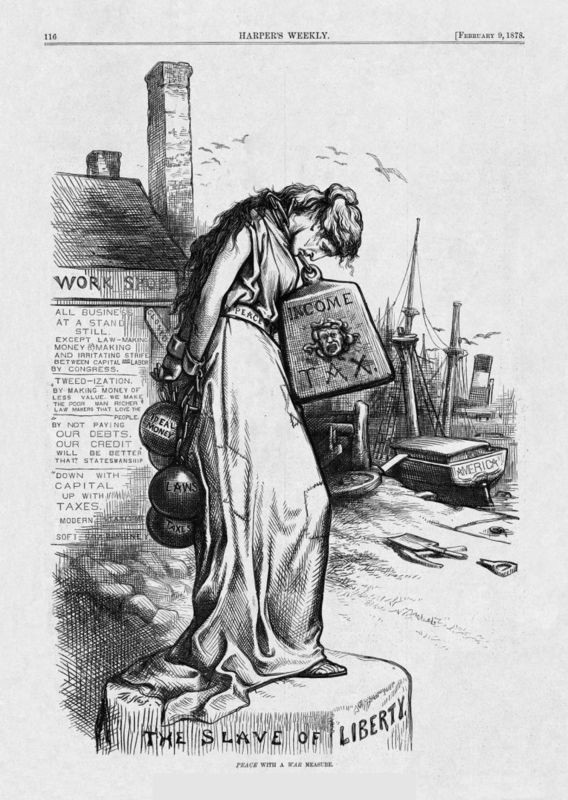 These effiorts prompted Thomas Nast to draw this cartoon in order to voice his opposition to the income tax. It is clear that although soft money, regulations, and other taxes were a burden for "Peace" (the balls and chains which bind her hands behind her back), by far the greater burden was that of the new war-time income tax which hangs about her bowed head. Nast also suggests that heavy taxes have brought commerce and industrial production to a low level and that corrupt law-makers use the income tax to whip up antagonism between "Capital" and "Labor". Nast and the anti-income tax lobbyists were able to defeat the proposed bills in 1878 but they were not able to keep it from being re-enacted in 1894 which prompted a Supreme Court challenge that the income tax was unconstitutional. The pro-inclome tax forces were able to amend the constitution (16th amendment) in February 1913 thus paving the way for that quitessential 20th century tax - the permanent peace-time income tax. The initial tax rate was 1% on incomes over $3,000. During World War 2 it reached the absurd level of over 100% on very high incomes. Another key new measure which made the income tax even more insidious was the introduction in WW2 of withholding the income tax by employers, who were now acting as unpaid tax collectors for the federal government.